The design argument is also known as the teleological argument. The argument looks at the idea of purpose and order within the universe to argue for the existence of God. 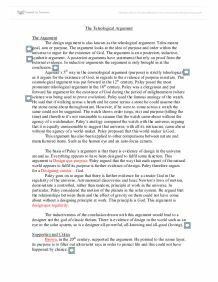 The Teleological Argument The Argument The design argument is also known as the teleological argument. Telos means goal, aim or purpose. The argument looks at the idea of purpose and order within the universe to argue for the existence of God. The argument is an a posteriori, inductive, synthetic argument. A posteriori arguments have statements that rely on proof from the external evidence. In inductive arguments the argument is only brought in at the conclusion. Aquinas's 5th way in the cosmological argument (purpose) is strictly teleological as it argues for the existence of God, in regards to the evidence of purpose in nature. The cosmological argument was put forward in the 12th century. Paley posed the most prominent teleological argument in the 18th century. Paley was a clergyman and put forward his argument for the existence of God during the period of enlightenment (where science was being used to prove evolution). Paley used the famous analogy of the watch. He said that if walking across a heath and he came across a stone he could assume that the stone came about through nature. However, if he were to come across a watch the same could not be suggested. The watch shows order (cogs, etc) and purpose (telling the time) and therefore it's not reasonable to assume that the watch came about without the agency of a watchmaker. ...read more. He argued that there is more to life than mere existence. Humans appreciate aesthetic activity, such as art, music and literature. This is not necessary for mere survival, so cannot have come through natural selection. Therefore life as we know it is the product of a designing creator. This last part of Tennant's argument is sometimes called the aesthetic argument. Tennant also formulated the anthropic principle, which I will consider later. Swinburne is another supporter of the teleological argument. He argued that order and sheer size of the universe makes it unlikely that it could just 'happen'. He also that the high degree of order that the universe demonstrates is evidence of a personal, conscious choice of God. From this order we can discern beauty. David Hume was a critic of the argument. He set out 2 versions of the design argument. The first of which, relied on an analogy. To which he argued implied a superhuman, anthropomorphic concept of God, which is very limited and inconsistent. The world is imperfect and flawed, and as such it could suggest an imperfect and flawed creator. Hume's second argument outlined the possibility that the world did come about through chance. He questioned the idea of there just being one God. Why could there not be more than one creator/God? Hume went on to support the idea of natural selection- he claimed that it is entirely plausible that the adaptations made by animals to survive might be the result of random adaptations, rather than the agency of an intelligent designer. ...read more. He argued that the universe might be in a state of chaos and confusion. And that our minds assimilate and organise sense experiences into a perceived order. Freud supported the view that the universe isn't actually ordered and argued that we impose a perceived order on a chaotic universe. Our minds are pre-disposed to see order, so we project order on to the universe. Post-modernist philosophy has argued that we impose order on the universe by talking it all into place. Our words create order out of chaos. However, modern science has argued for an order of sorts: The anthropic principle. This principle, 1st suggested by tenant, argues that life on earth exists because the laws that govern the universe have particular features that contribute to make life possible. E.g. the fact that gravitational force is constant and that the expansion rate of the universe is stable. The principle has strong and weak forms. The strong argues that the conditions required for life are intrinsic to the nature of the universe and that life was inevitable. The weak form states that the conditions required for life in the universe happen to have occurred. Others argue that the weak form is merely an observation, and the strong form is based on flawed logic. Voltaire said that he 'cannot accept how the clockwork of the universe can exist without a clockmaker'. Davies put forward the view on cumulatively whereby when put forward with other arguments such as the cosmological there is a stronger case for the existence of God than not. ...read more. This essay includes a good range of different thinkers and different points concerning the argument from design. Most of these are not developed in any detail though and so many of these basically contribute nothing to the essay. For example, conclusions are just mentioned without explanation of why they are supposed to be the case. In order to be rewarded for knowing thinkers and their arguments, it is necessary to demonstrate that you actually understand the arguments referred to. Adding critical comment, e.g. evaluation of the arguments, is a bonus but, again, is not demonstrated here. Most of the content is accurate, but there are a few mistakes. It would be better to focus on explaining the things that you do understand, rather than writing superficially about a variety of things loosely remembered, but not understood. However, if another purpose was to allow a couple to show their love and obtain pleasure while doing so, then it could be justified. This definition of purpose would rule out masturbation, but not sexual foreplay or even adultery. *Principle of Plentitude* at this juncture, which states that if something is a real possibility, then given an infinite amount of time, it should happen. Real possibilities show up.13 It is a real possibility that if everything is contingent, everything could go out of existence at once, given that time is infinite at any point, such as now. For example, photosynthesis is vital for our existence and plants do not fail to follow this cycle, furthermore many animals migrate to hotter or colder climates or to breeding grounds at the same time annually or monthly in order to ensure survival. This analogy aims to show the difference between appearance and reality. The prisoners represent ordinary people, who have not yet gained true knowledge. 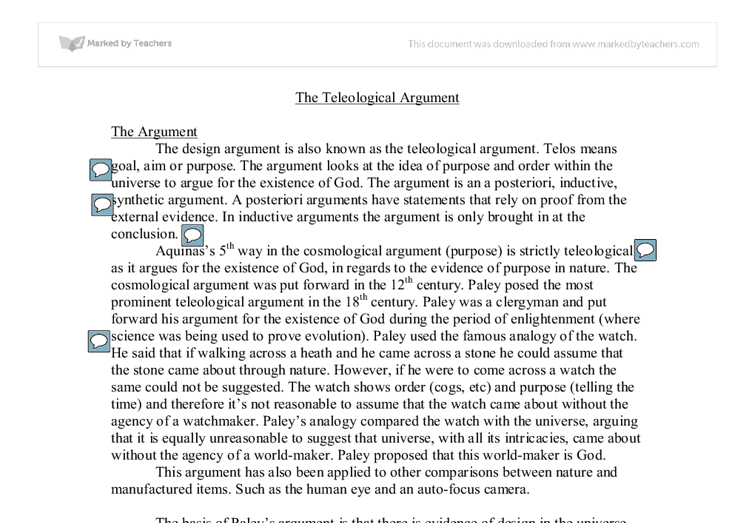 The evidence for design put forward by philosophers like Payley appears to suggest towards the possibility of a designer, even so it does not directly confirm that God is this designer. At the end of the day it is just a hypothesis. Forms have a greater reality than objects in the physical world both because of their perfection and unchangingness, and because they are models. Plato thought that the Forms were interconnected, and arranged in a hierarchy. The most important is good, the ultimate principle. This is qualifying our language to talk about God. Aquinas' other theory is of attribution this is the claim that God is the creator of the universe, there is however no link between God and the universe other than that he created it. ?you can now travel at the national speed limit?, they have no other effect. Symbols are powerful and they actually take part in the power and meaning of what they are symbolising. The cross is the symbol for Christianity. Not only is it a marker for that religion, but it also makes a powerful statement.